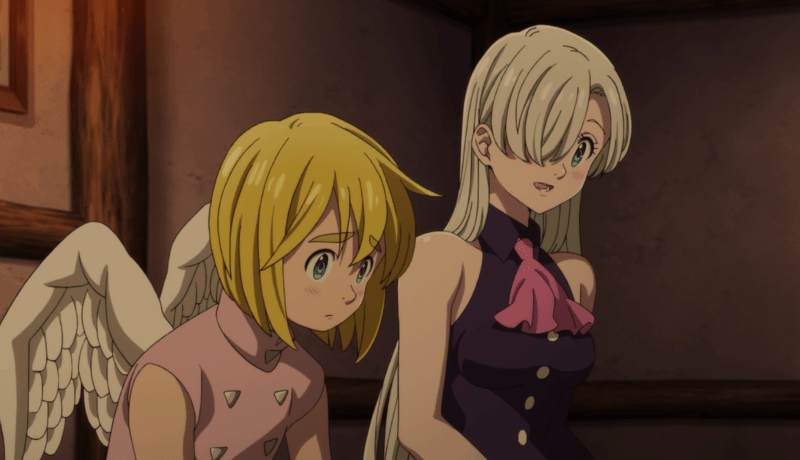 While not particularly groundbreaking or symbolic, PRISONERS OF THE SKY's loveable characters and intense action scenes make a great spin-off film for SEVEN DEADLY SINS fans. We’ve all heard of flying castles, but what about flying fish and pigs? THE SEVEN DEADLY SINS: PRISONERS OF THE SKY explores new terrain in this action-packed spin-off film that is sure to keep you on the edge of your seat. If you’re new to the SEVEN DEADLY SINS series, here’s a quick recap of the story thus far. 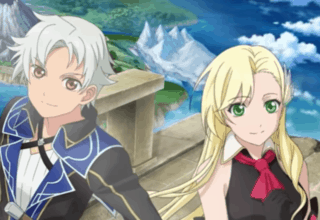 In order to save her father and her kingdom from the mutinous Holy Knights, Elizabeth, the third princess of Liones, sets out to find the Seven Deadly Sins. She journeys far and wide in search of these powerful warriors who protected the realm before their exile. 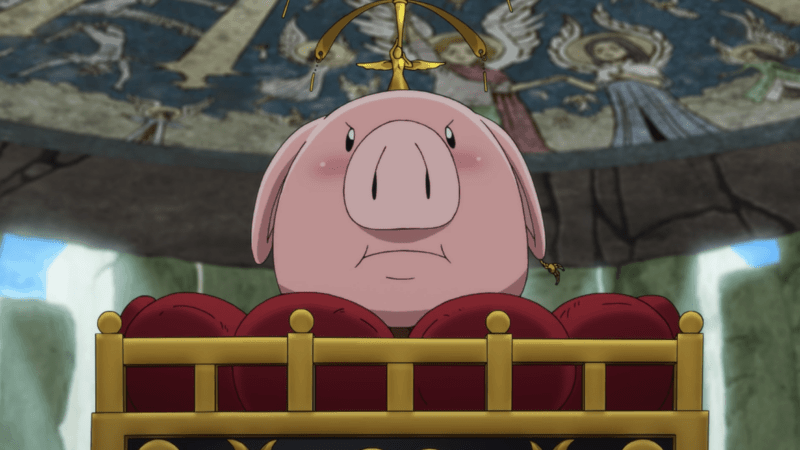 During her search, she meets Meliodas, the sin of Wrath, and Hawk, a talking pig. Elizabeth, Meliodas, and Hawk unite with the remaining Sins: Gowther, Diane, King, Ban, Merlin, and Escanor. Together, they fight against the Holy Knights before the Knights can revive the Demons and bring about a bloody war. PRISONERS OF THE SKY takes place after the second season when all seven Sins join powers to prevent the revival of the Demons. As a spin-off movie, PRISONERS OF THE SKY’s story takes place outside of the series’ canon and introduces new characters. 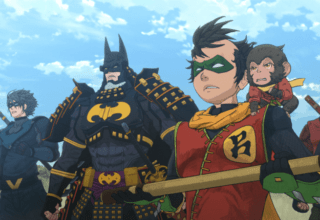 Although knowledge of the series isn’t needed to enjoy the film, the story contains major spoilers about character identities and backgrounds. I wouldn’t recommend watching it unless you’ve already seen the previous seasons (or read the manga!). 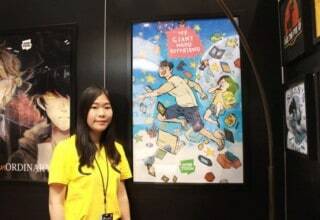 Netflix premiered the film, both dubbed and subbed, on December 31, 2018. The film introduces a whole new race to the series: the Celestials. A winged race descended from the Goddesses, the Celestials live in a lush land tucked away in the clouds. Their sacred task is to protect an egg that seals away powerful Demons. 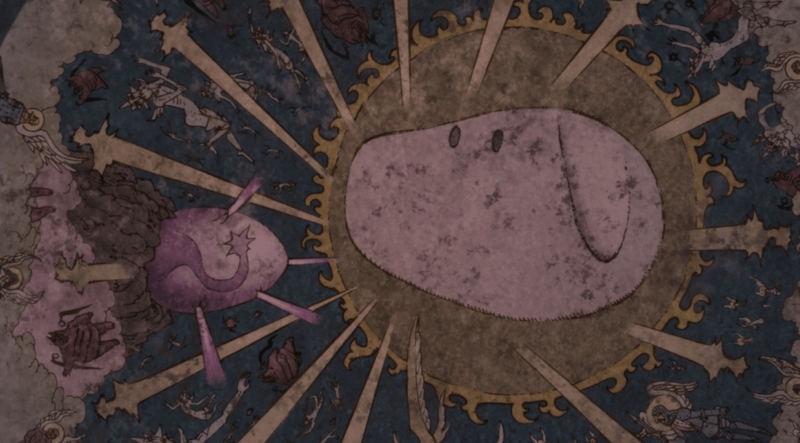 Legend tells of a great white being named Oshiro who saved the Celestials from these Demons and bestowed them a sacred sword to use against the Demons if the seal ever breaks. While hunting for the mythical Skyfish, Meliodas and Hawk fall into a magic pond that carries them to the Sky Palace of the Celestials. At the same time, a Celestial named Solaad travels through the portal because he believes that the seal will soon break. Journeying to the surface to find the Great Oshiro, Solaad meets Elizabeth and the Sins. 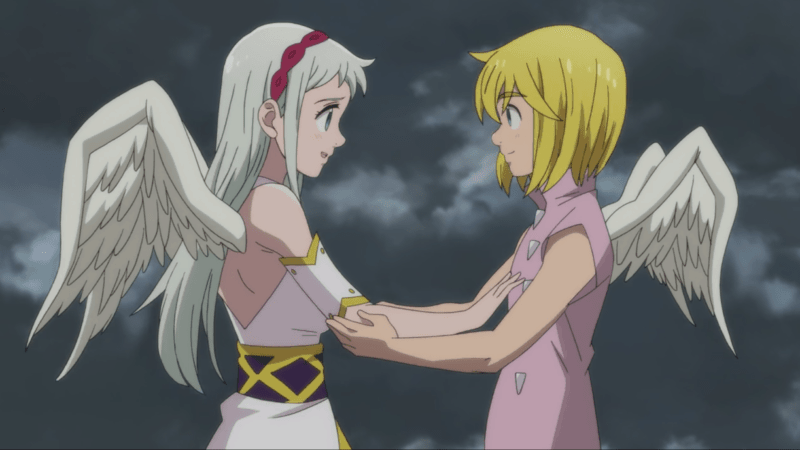 They agree to help Solaad while searching for Meliodas and Hawk above the clouds. But after 3,000 years, the seal breaks when they arrive and an army of Demons descends on the Celestials’ home. It’s up to Elizabeth and the Seven Deadly Sins to save the day once more! Warning: Spoilers for the main series ahead! In this action-packed adventure, Meliodas and the others fight to keep the sacred land above the sky in one piece. As far as action anime goes, THE SEVEN DEADLY SINS has to be one of my favorites. Each episode is filled with ridiculous fight scenes that go way over-the-top. Every fight aims to outdo the last with its exaggerated punches and impossible techniques. And of course, every character has special moves they shout out before using. Yet, the series never takes itself too seriously and that’s what makes it so undeniably charming. 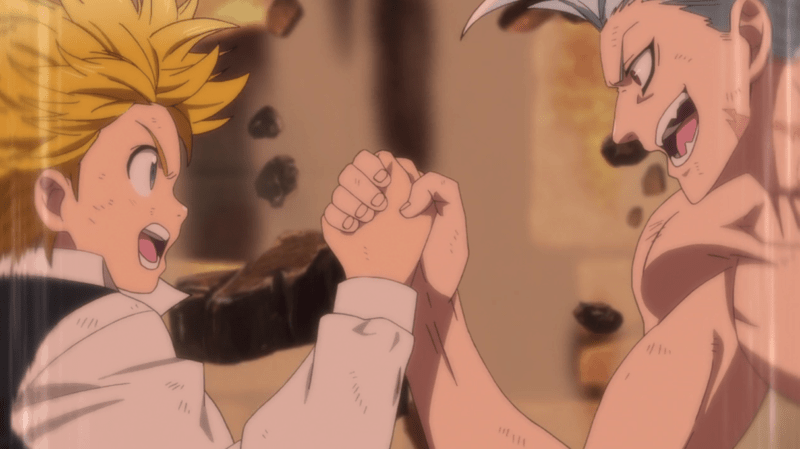 THE SEVEN DEADLY SINS makes use of the over-powered characters perfectly with intense secret handshakes and arm wrestling matches that take down entire buildings. PRISONERS OF THE SKY brings home the same feeling as the main series. Solaad’s quest gives the film a serious focus, however, leaving little room for the show’s usual shenanigans. Instead, PRISONERS OF THE SKY touches on topics like tradition vs. change and the duty to one’s people. When Solaad leaves his home to find Oshiro, he breaks a law forbidding travel to the surface. Fortunately, his bravery bears fruit when he finds the Seven Deadly Sins. If you’ve seen the main series, you’ll notice this theme parallels Elizabeth’s own quest to find the Sins. Despite Solaad’s physical weakness, his courageous decision proves his inner strength. His journey mirrors Elizabeth’s and the positive outcome shows hope for the main series as our characters enter the next chapter of their adventure. The plot is simple and predictable, yet entirely enjoyable. What little plot twists the movie offers can be seen a mile away. Despite its predictability, PRISONERS OF THE SKY offers new characters and a new setting that meld together nicely with the story’s canon. The action aims to please and the comic relief, while not as frequent, is still great. Comedy bits between Hawk and the Celestials (although still predictable) broke up the more serious fight scenes nicely. However, the film uses the same tropes as many action anime: uncomfortable physics and conveniently placed camera angles. 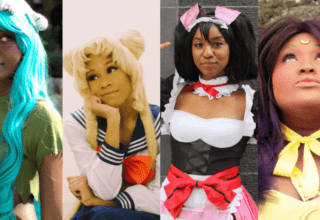 Fan service is common in a lot of action anime and THE SEVEN DEADLY SINS is no different. Fortunately, the only noticeably uncomfortable scene takes place in the beginning and the fan service peters out quickly after. With only one cringe-worthy scene, the film redeems itself and remains enjoyable. However, the fact that the film opens with a raunchy scene might drive many potential viewers away (reasonably so). It would have been best if the scene wasn’t included at all. Unfortunately, that’s just the way it is with some genre of anime and, given the amount of fan service I’ve seen in other shows, SEVEN DEADLY SINS is pretty tame. Solaad’s quest to find the Great Oshiro doesn’t succeed entirely; instead, he meets the Sins. But, when Meliodas and Hawk land at the Sky Temple above the clouds, they learn that Hawk resembles Oshiro! Hawk’s likeness to Oshiro leads to some amusing misunderstandings when he attempts to curry favor with the local shaman. Unsurprisingly, Hawk fibs his way into making the locals believe he’s Oshiro’s descendant. Although we still don’t know much about Oshiro, it’s hinted near the end that Hawk may actually be related to the real deal. Other than the legend of Oshiro, we don’t see much about the culture and history of the Celestials. I would have loved to learn more about them through the eyes of Meliodas and Solaad. Granted, only so much lore can be squeezed in between all those bulging muscles and cranium-crushing punches. The Celestials as a people, however, were a wonderful addition to the series. In the main series, we don’t learn much about the history or likeness of the Goddess race. The idea of a race descending from the Goddesses, whose sole responsibility is to protect the surface from the Demons was inventive. They fit in nicely with the main canon and don’t feel awkward or out of place. One thing to note about the Celestials is their convenient placement at the precipice of the resurrection of the Demon race. The laws condemn the Celestials to the sky in order to protect the world from the Demon race’s return. Yet we never learn how and why these laws came to be or why the Celestials believe that Demons took over the surface 3,000 years ago. Although these important questions are left unaddressed, we can make our own inferences. Given their ancestry and the ambiguity of the Oshiro legend, one possibility is that the Goddesses made these laws. The Celestials became their knights, protecting the realm from the sealed Demons. Knowing the manipulative personalities of said Goddesses, this does imply that the Celestials, whom the Goddesses knew would not have the firepower to stop these Demons, were simply fodder to keep the Demons at bay. As the film’s title suggests, the Celestials may well be prisoners of their own laws. All we know about their history is the Oshiro legend. The rest of the story remains shrouded in mystery and up for interpretation. In any case, the placement of the Celestials and their strange laws is an interesting addition to the already surprisingly complicated motivations of the main cast. Who knows what other secrets the Goddess race keep? Each of the Seven Deadly Sins received their own time in the limelight, some more than others. 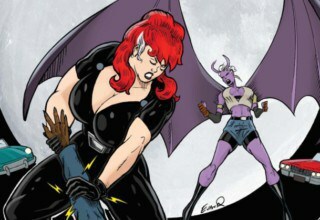 PRISONERS OF THE SKY showed Elizabeth’s strengths as the moral support of the group. While I wish she was less of a damsel in distress in general, Elizabeth’s character is still lovable for her determination and unwavering support. She inspires Solaad to fight and persevere even though he lacks strength and training. The other Sins each received their well-deserved limelight during intense battles with the Demons. 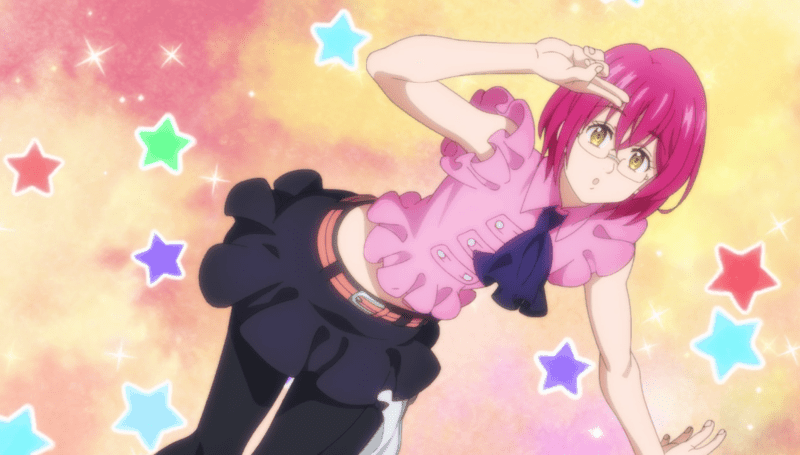 Gowther especially received more screen time with his charming personality. He breaks up the action and masculine comedy bits between Meliodas and Van with his amusing expressions, poses, and smashing of the gender binary. The new characters, Ellatte and Solaad, were also done well, though they lack significant character development due to time constraints. Ellatte, Solaad’s fiancée, was feisty and courageous; a breath of fresh air for the film. 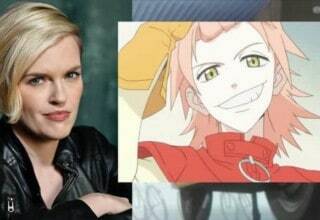 Although her character deserved more fighting to show off her strength, her scene with one of the Demons showed hope for the series’ female characters. When Meliodas flies onto the scene to help Ellatte dodge a nasty surprise attack, I expected him to tell her to go home. Instead, he hurries off to fight his own battle, trusting her to take the Demon down on her own. Good work, Mel! 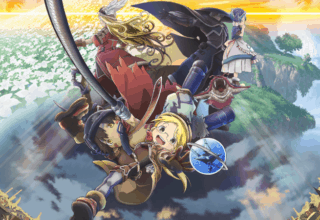 PRISONERS OF THE SKY displays improved animation quality overall. With a wider time frame to work with and no weekly episode deadlines, the animators likely had more time to dedicate to the smaller details and it shows. Fight scenes flowed nicely and the timing of battles worked like clockwork; perfect chemistry when broken up with comic relief and some plot. 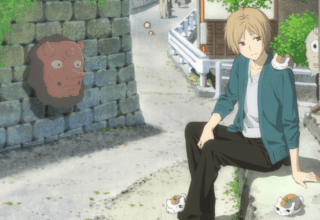 However, the animation lacked development for the background characters and supporting cast. 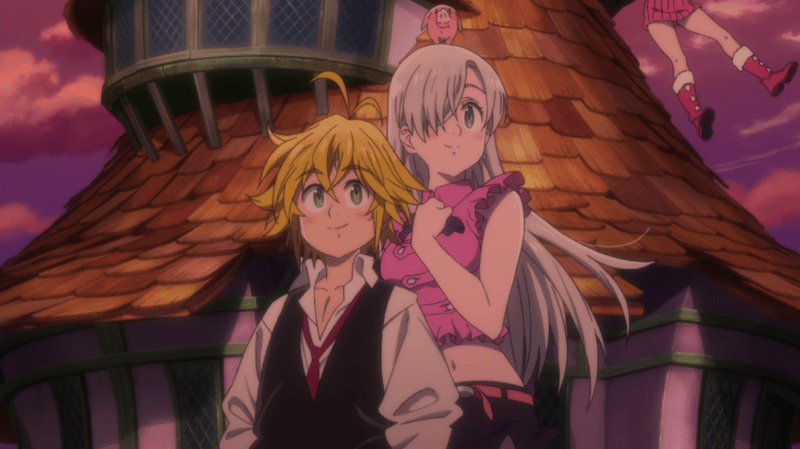 Ellatte and Solaad’s similarity to Elizabeth and Meliodas’ designs contain no obvious symbolism for the story other than to further mirror Elizabeth’s initial journey. This symbolism fails to impress and makes the design look a little sloppy. The laziness also shows through the background characters; many of the Celestial soldiers were faceless! Despite the lacking character design, the film still displayed good animation techniques. The background and setting overall takes your breath away. 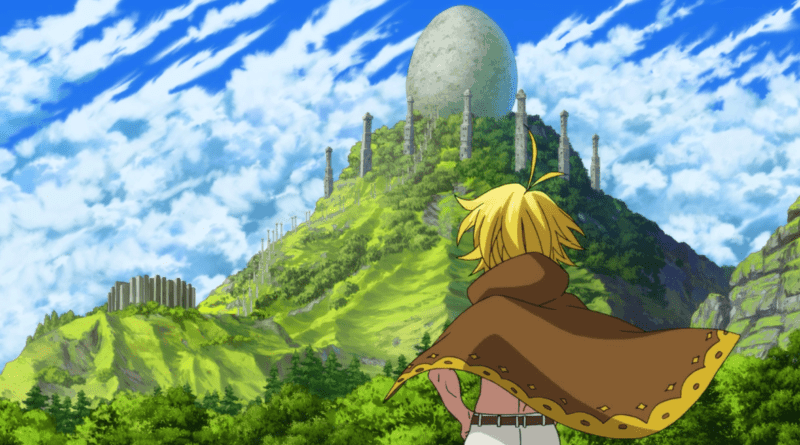 SEVEN DEADLY SINS usually pours its animation efforts into action scenes, but PRISONERS OF THE SKY shows off the team’s skills with beautiful landscapes (or rather, skyscapes). The Sky Temple, lush with meadows, features an ancient ruin aesthetic. The Celestials’ home above the clouds is hands-down the most beautiful setting we’ve seen in the series thus far. The theme “Tradition vs. Change” is one I love seeing in films. Should a group bend to the winds of change, even if that means breaking thousands of years of tradition? Although PRISONERS OF THE SKY did not delve too deeply, it did a fine job addressing the theme lightly. 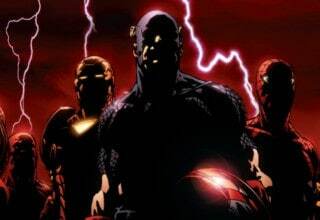 The film presents the issue of whether the Celestials should adapt to their circumstances or stick to their traditions. Solaad’s solution breaks many laws, including treading on sacred ground and abandoning their post above the clouds. On the other hand, keeping tradition puts their people at risk. Even if the Demons do return, the Celestials think their strength alone will be enough. To Solaad, the answer is obvious. Although breaking the law is hard, he believes the Demons will resurrect and journey to the surface for help. In the end, his spirit inspires his people to trust the Sins and combine their powers. PRISONERS OF THE SKY uses a common theme in an unoriginal way but still remains enjoyable and charming. In any other genre, the themes used in this film might seem weak or unfinished. For this genre, however, the film used just the right amount of symbolism to work in the way it needed to. 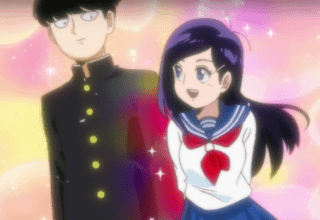 Seeing our favorite characters pull their signature tropes and antics was more than enough to make it work. It didn’t feel tired and old; instead, it felt nostalgic. It isn’t often that a spin-off anime movie is as enjoyable as PRISONERS OF THE SKY! Overall, PRISONERS OF THE SKY is a fun film to watch. It stays true to the series’ story and characters while bringing something new to the table. The action-packed, delightfully exaggerated fight scenes keep viewers excited and on the edge of their seats. The art and animation, although lacking in some aspects, exceeded expectations. Solaad’s home above the clouds proved that the series is capable of much more than just action. I have high hopes for how the animation team will continue to impress with scenery in the future! 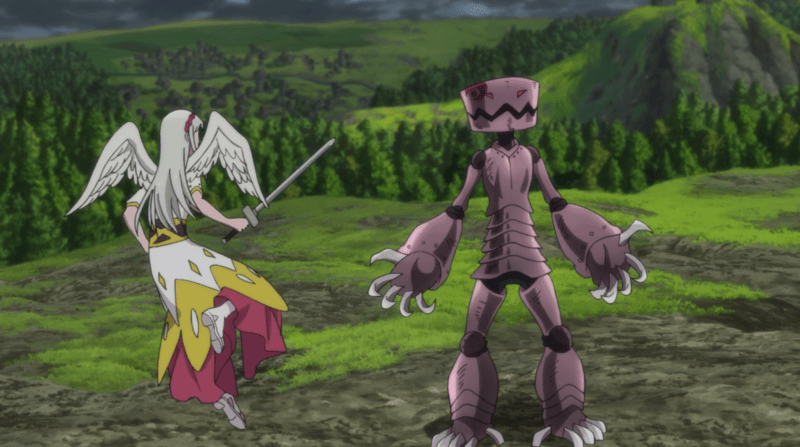 Solaad and his fellow Celestials offer new possibilities for the series to explore its lore beyond the confines of the manga. Though the lore of the Celestials lacked significant depth, the loose ends leave just enough room for creative interpretation down the road. For a series so focused on action, the small amount of symbolism and world development was perfect. 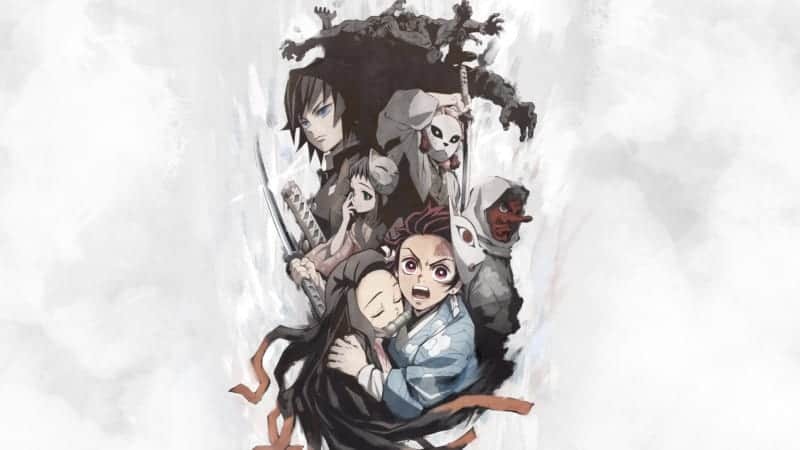 Although the constant barrage of action and somewhat lackluster story might not be everyone’s cup of tea, the animation is quality and the characters are lovable. SEVEN DEADLY SINS fans are sure to love this spin-off film. So if you’re a fan of the series, or maybe you just really like movies about floating castles, PRISONERS OF THE SKY is a great way to spend a Saturday night! I’m really relieved to see that this did so well. Most movies based on anime series are really hit or miss, so I’m glad that this one stays pretty faithful to the original content. I’ll have to check it out soon. Have you tried out 4 Cut Hero yet? It’s another action series that I’ve been reading along with SDS. It’s based on an RPG and uses a mixture of a fantasy world and a modern world. It also draws heavily on comedy, so it really stands out against the mega serious action series that are out right now. If you haven’t tried it, I highly recommend checking it out!